We are well known for painting this pub every Christmas with winter scenes but this year (2013) the pub has changed hands and is under new management. The old landlord wanted to paint the pub one last time with a spring theme rather than just going back to white and the new owners are really happy with the results! They will be keeping up the tradition of painting the pub every Christmas, but for now you can enjoy this scene of rebirth and renewal. 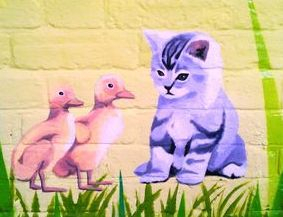 It took Sam and I 10 days to paint the entire pub with blossom trees and baby animals. On the side wall leading to the car park we painted this striking image of a young girl blowing a Dandilion. You can see how we painted this building by watching these time-lapse films.